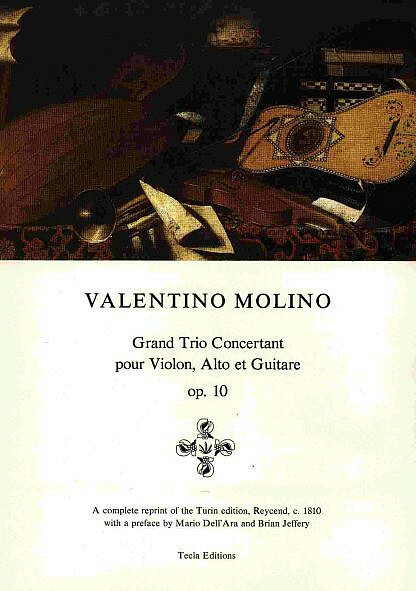 Valentino Molino’s Grand Trio Concertant op. 10 for violin, viola, and guitar is a chamber work with character from early 19th century Italy. With a preface in Italian and English by Mario dell’Ara and Brian Jeffery. Reprint of the first edition, Turin, c. 1810. Parts only, no score. First published by Tecla in 1986. SORRY, THIS ITEM IS NOW SOLD OUT. (It is still for the present included in Romantic Chamber Music with guitar, of which we have only a few sets left).